Voices is a professional development program for Adult Education and Literacy (AEL) staff. VHC collaborates with Learning Works, Vermont’s network of regional centers for adult education and literacy services. These centers work with adults who need basic academic skills, youth who are in a high school completion program, and English Language Learners. Learners may be working to obtain a high school credential, and to increase their chances of employment or improve their work situation. VHC has trained Learning Works teachers across the state through Voices. 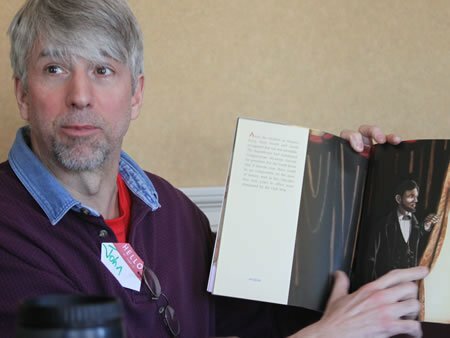 The program helps educators gain skills in facilitating book discussions. Teachers who participate in a Voices training learn how to impart the value of reading and discussion as a form of community engagement and as an avenue for gaining essential skills. The students feel respected and intelligent when we discuss a book. It’s not math; it’s not grammar; it’s just an opportunity to exercise thought and opinion in a respectful and constructive way. Voices-trained teachers can request free books from VHC so they can they incorporate reading and discussion as part of their instruction. Students keep these books to use on a regular basis and build their home libraries. This model’s strength is that it uses quality literature at the learners’ reading level — a mix of children’s, young adult, and/or adult — and discussion as tools for literacy in the Adult Education classroom. Through reading, creatively facilitated discussion and activities, students are engaged with an array of literature to meet their interests, while linking the process and content to the adult learning standards.